After cruising to a Big East tournament title, Villanova reclaimed the No. 1 spot heading into March Madness. Well, that was a wild season. We had six different No. 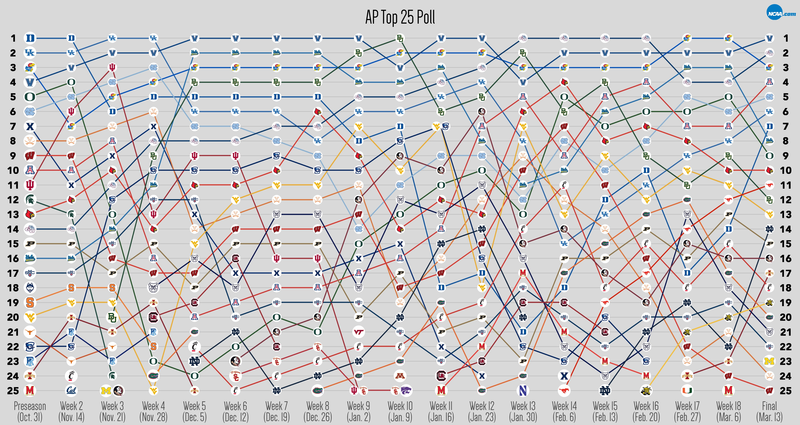 1 teams in the AP Top 25, 12 different teams in the top 5, and 42 teams that were ranked at some point during the year. But the regular season is over, the conference champions have been decided, and now a little thing called March Madness awaits. 9 -- conferences that are represented in this week's Top 25. The ACC has six, while the next closest (the Big 12) has four. By weighting the conferences by team rankings (No. 1 is worth 25, No. 25 is worth 1), the ACC comes out in first place, followed by the Big-12, and the Pac-12 — the only conference with three teams in the top 10. 8 -- spots, the biggest jump this week: by Notre Dame (No. 22 to No. 14). The FIghting Irish finished the season winning eight of their last 10, including a run to the ACC conference championship game during which they took down No. 21 Virginia and No. 16 Florida State before falling to No. 14 Duke. That performance also earned Notre Dame a 5-seed in the NCAA tournament. 5 -- spots, the biggest drop this week: by UCLA (No. 3 to No. 8). The Bruins won nine straight to close out the regular season, but lost to No. 7 Arizona 86-75 in the semifinals of the Pac-12 conference tournament. 5 -- weeks, the longest upward streak: by SMU. The Mustangs entered the rankings at No. 25 in Week 14, are in the midst of a 16-game winning streak and have only one loss over their past 27 games. They also steamrolled their way to an AAC tournament championship. That's about as hot as you can get. Along the way, SMU took down No. 11 Cincinnati 60-51 on Feb. 12, and No. 15 Cincinnati in the AAC title game — their only two Top 25 wins of the year. 5 -- weeks, the current longest streak down: by Wisconsin. The Badgers lost five of their final seven games of the regular season before making it to the Big Ten championship, which they dropped to Michigan. All six losses came against unranked teams. Not the ideal way to end the season. 12 -- teams that have been ranked in the top 5 at some point. Duke (Preseason, Weeks 2, 4-8), Kentucky (Preseason, Weeks 2-4, 11, 12), Kansas (Preseason, Weeks 3-Final), Villanova (Preseason-Final), Oregon (Preseason, Weeks 2, 14, 18), UNC (Weeks 2-4, 17, Final), Indiana (Week 3), Baylor (Weeks 5-10, 12, 13, 15), UCLA (Weeks 5-11, 16-18), Gonzaga (Weeks 9-Final), Arizona (Weeks 13, 15-16, Final) and Louisville (Week 14). 6 -- teams that have been ranked No. 1 this year. Duke (Preseason-Week 2), Kentucky (Weeks 3-4), Villanova (Weeks 5-9, 11-12, Final), Baylor (Week 10), Gonzaga (Weeks 13-16), Kansas (Week 17-18). 0 -- teams that never dropped in the rankings. Through Week 16, one team had never dropped: Gonzaga. The Bulldogs began the season at No. 14 and steadily climbed to the No. 1 spot and a 29-0 record before falling to BYU at home, 79-71 on Feb. 25.